Hi, come today , bring another vector art of my favorite blonde. This is my third vector on minitokyo. 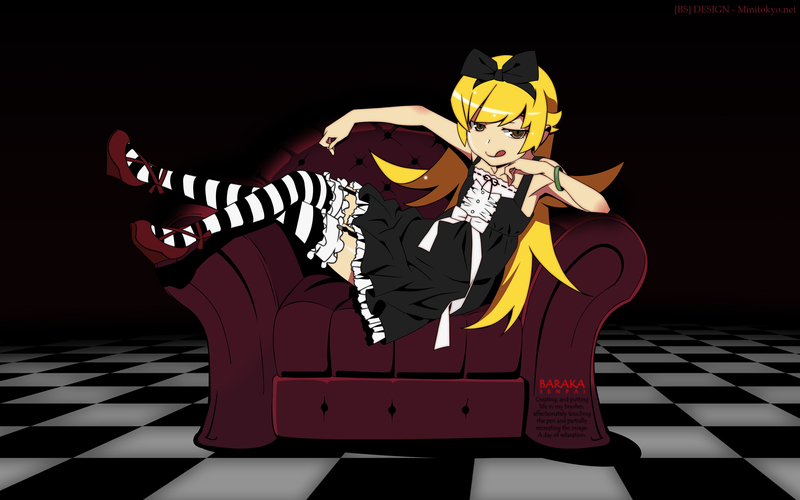 I love the Shinobu Oshino, is my favorite character. I have more pleasure of drawing. Akio Watanabe BANZAI ! Using simple pen Photoshop passe a beautiful image . GIF showing the steps . Ooh, love the smoothness of the vector! I'd add more "blur" in the background tho, make it fade out even more at the floor. I will make an alternate version and make the upload. The chair and girl are directly facing the front so the lines of the floor should be moving in the direction toward the middle as goes further away (I don't think I'm phrasing this right). You can use distort image for a quick fix. The vector looks great. Your lineart is super smooth and super crisp. What Redwyn is trying to say is that the floor should look like THIS. That's the correct perspective for a front view. Another thing I would advise is adding more elements to the BG. A painting or some texture depicting a wall(paper). So that the BG isn't so empty.